The article Polyvinyl Alcohol–Borax Slime as Promising Polyelectrolyte for High-Performance, Easy-to-Make Electrochromic Devices has been selected by the journal ChemElectroChem for the front cover of its latest issue. It was chosen for two reasons: the importance of the research, which uses an old-known material for the design of electrochromic devices (ECDs), and the imagination of the authors, for recreating a cover based on a cartoon, both with one thing in common: Mattel Toy Corp. The scientific study uses a material discovered in the 1970s by Mattel Toy Corp. to develop a new polyelectrolyte used in ECDs. This material is none other than “slime”; famous for its fun appearance and slimy feel and which had a massive impact on the childhood of many children. It is a mixture of polyvinyl alcohol and borax which creates a viscoelastic gel which is reversible because of the bonds present in the material. When combined with a viologen or redox couple, the researchers obtained a polyelectrolyte that overcomes the limitations associated with classic liquid and solid electrolytes. The gel combines the advantages of both, making it easier the assembly of the device and preventing bubbles from appearing.Therefore, transparent ECDs can easily be produced with excellent properties for this type of application, such as its switching time, wettability and cyclability. 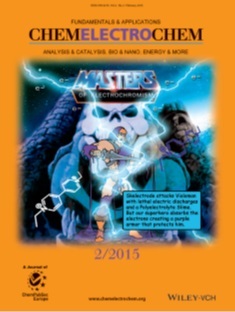 Science and imagination are combined creatively on the cover of the journal, in the style of a comic strip.The inspiration came to the creators when they realised that the slime, discovered by Mattel Toy Corp as explained before, was also used as a weapon in the famous cartoon series from the early 1980s, “He-Man and the Masters of the Universe”. In the cartoon, He-Man, the most powerful man in the Universe, embodies Violoman (the viologen from the electrochromic system). Violoman is attacked by the villain Skelectrode (Skeletor in the famous series) with lethal electrical discharges (electrons) and chemically-modified slime (polyelectrolyte). However, by his nature, the superhero Violoman is capable of neutralising the electrical discharges he receives (redox reaction in the viologen) by creating a purple shield that protects him from the villain Skelectrode. This original front cover shows that while science has to be serious, it does not have to be boring. But on top of that, it should be noted that the good properties of the newly developed polyelectrolyte make it a strong candidate for the development of ECDs and for their industrial application in smart windows for buildings and vehicles or in other electronic components, such as screens or displays.